Towards the end of October we start seeing lots of recipes for pumpkin this and pumpkin that. This one is different. It involves liquor and a blender, but it is something I recommend you do with kids. It takes very little time to make, but your kid might want to take it to school for her science fair project. Unfortunately, you probably won't want to eat it. But it's fun. We're going to extract the DNA from a pumpkin. The very stuff of life. A pumpkin. This recipe will work with apples, bananas, squash, carrots, or just about anything else you have in the fridge, but I'm writing this in October, so we're using a pumpkin. A quarter cup of dishwashing detergent. I like the kind that has nothing in it but the detergent. That will ensure that weird additives won't spoil our experiment, but the stuff you have in the kitchen will probably work fine even if it is dark green and smells funny. Some alcohol, the closer to 100% alcohol you can get, the better. 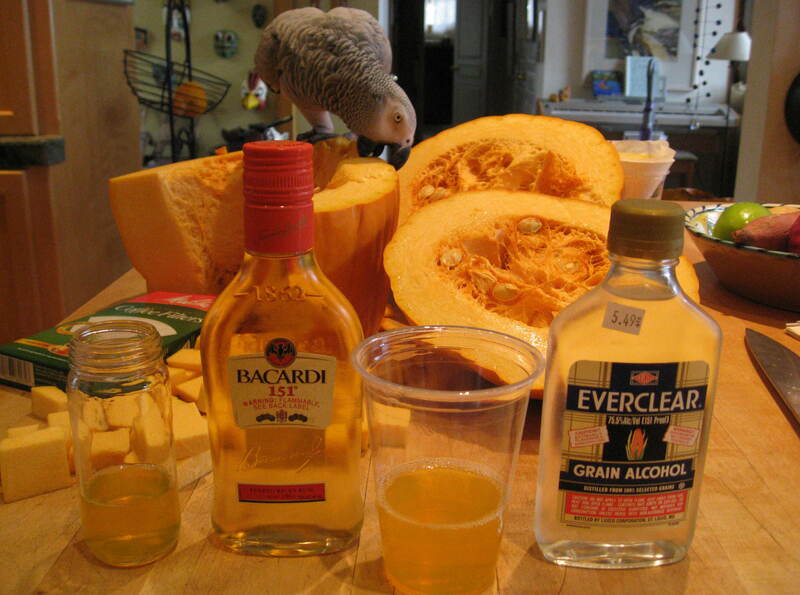 You can use rubbing alcohol, which is about 70%, or you can get 91% isopropanol at some drug stores (that's what I normally use), but you might already have some 151 proof rum, or some Everclear grain alcohol close to the kitchen. Not being a drinker, I had to go out and buy some for the photos. Someday I'll cook up something that needs to be set on fire to use up the remainder of the bottle. Put the alcohol in your freezer right now. We will want it as cold as we can get it for our experiment. It won't freeze — you can keep it in the freezer overnight or forever. But an hour in the freezer will probably do fine. A coffee filter and a funnel. You can use a coffee maker in a pinch, but rinse it out when you're done. I use a Melitta #2 filter, but a paper towel folded into quarters will also work fine. 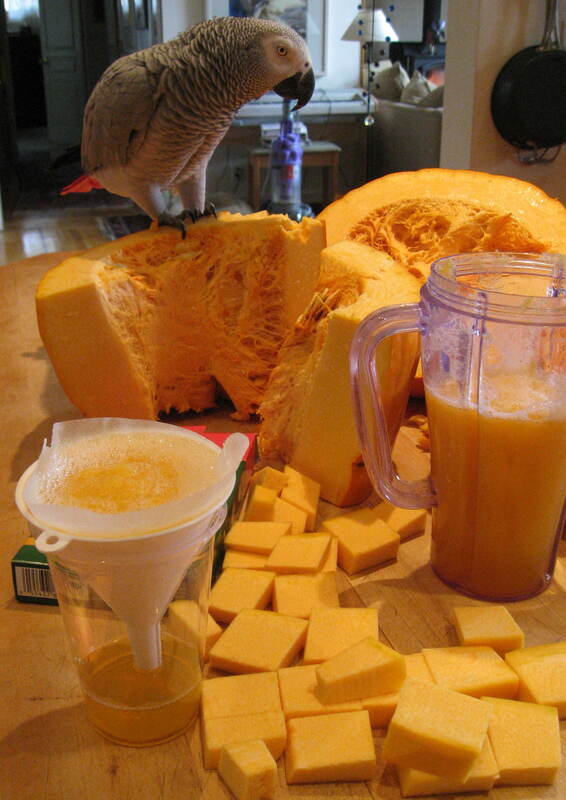 Cut the pumpkin into small chunks that fit in the blender. My assistant Corky helps me with all my Halloween projects. 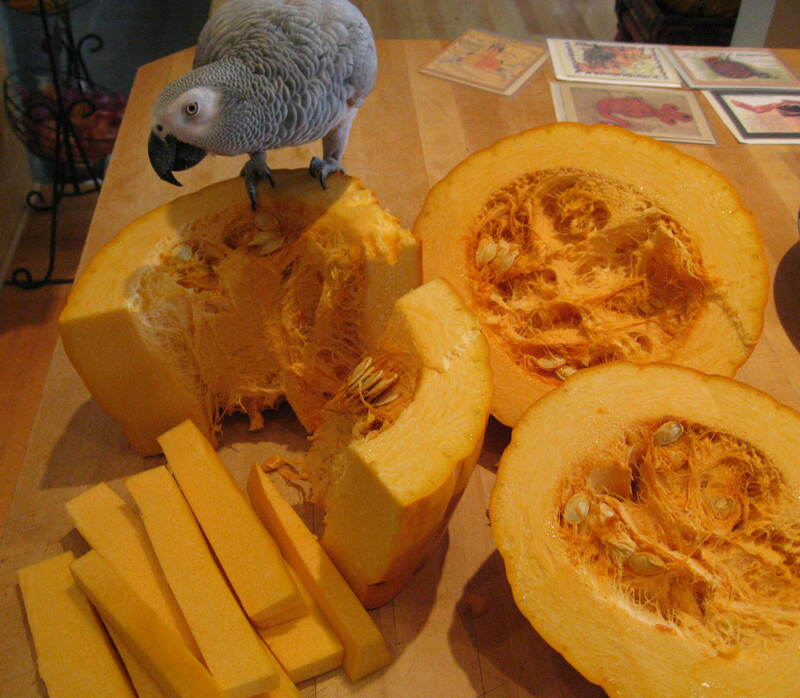 He also likes to eat raw pumpkin, something your helper might not find so tasty. 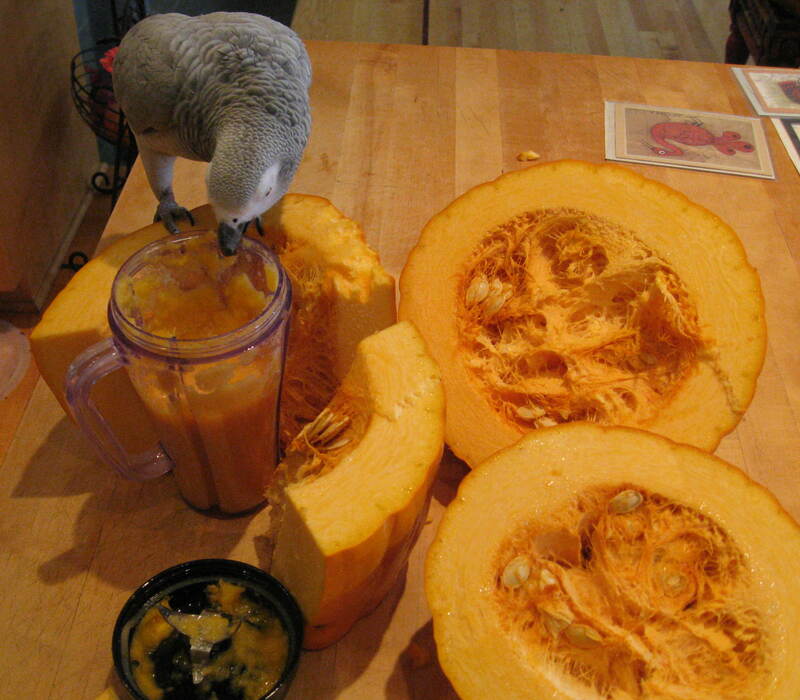 Have your assistant place the pumpkin chunks in the blender, as shown in the photo. Add about a half cup of water to the pumpkin chunks, and a tablespoon of salt. Blend until most of the chunks are pureed. We don't need to be perfect, or blend forever, since we are going to filter later. And blending too long will break the DNA strands. But we want something resembling applesauce when we're done. Your assistant is allowed to taste the results. Now we add a whole bunch of dishwashing detergent. About a quarter of a cup. Your assistant is no longer allowed to sample the recipe after this point, but may look at it kind of funny. The detergent and the salt will break open the cell walls of the pumpkin, releasing the DNA into the water. Next we filter the puree using the coffee filter and funnel. Now it is time to get the liquor out of the freezer. You did remember to put it in there, at least an hour ago, right? 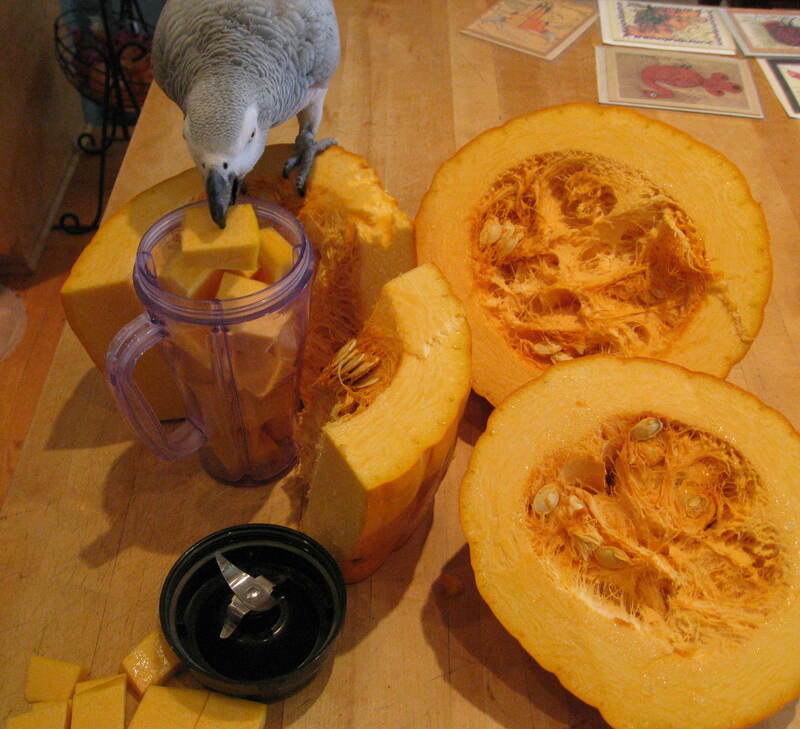 Your assistant is not allowed to sample the liquids, but may continue eating the raw pumpkin. For this part, a shot-glass would be appropriate. Too bad I don't have any. I used a spice jar instead. We could have just used the plastic cup, but a smaller diameter container (like a test tube) is normally used. 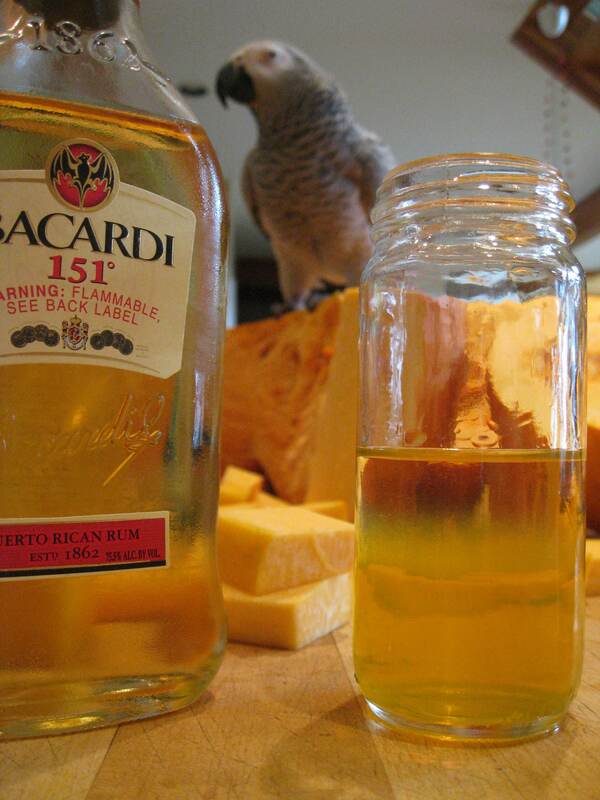 Pour some of the filtered pumpkin juice into the container. Now, tilt the container and very gently pour some of the alcohol slowly so that it forms a layer on top of the juice, and does not mix. After a few seconds, you will see a ghostly layer of DNA form between the juice and the alcohol. It looks like ghost ectoplasm — a white slimy band of goo floating in the middle of the shot-glass or spice jar. Pumpkin is made of water, cellulose, sugars, proteins, salts, and DNA. To extract the DNA, we need to get it out of the inside of the pumpkin cells, and then separate it from all that other stuff. The first step is the blender. It breaks up the cellulose fibers holding all the cells together, allowing the salt and detergent access to the plant cell walls. Plant cell walls are formed of cellulose, but inside the cellulose wall is another cell wall called the cell membrane. It is made up of fats, sugars, and salts, and forms two layers, with the fat molecules on the inside, where they can stay away from water. Detergent has molecules that like fats at one end, and water at the other end. The end of the molecule that likes fat sticks to the grease on your dishes, and the other end sticks to the water in the sink. As you scrub, the grease breaks up into smaller and smaller droplets, and the detergent surrounds them so that they don't coalesce back together. Then you rinse them down the drain. 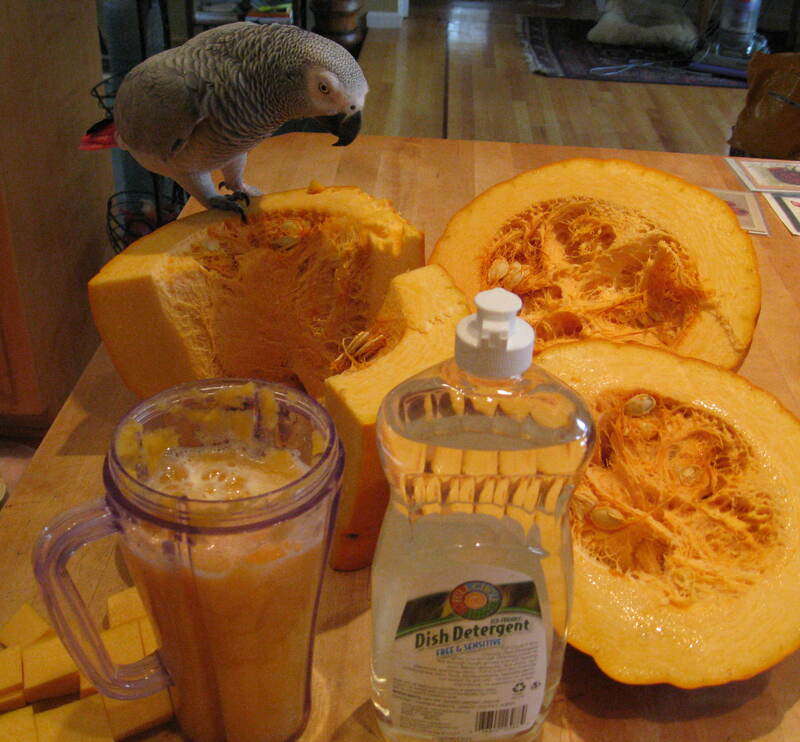 In the pumpkin juice, the detergent molecules attach to the fat part of the cell membrane and break it up as you stir, since the other end of the detergent likes water. This opens the cell up, and the DNA inside spills out. DNA dissolves in water, so it stays in the juice. But when we float some alcohol on top, the DNA comes out of solution, and precipitates into the white goo we see at the bottom of the alcohol layer. We have separated the DNA from all the other stuff in the pumpkin cells.